Thermalec Electric Heaters are a high quality British made product renowned for their reliability. Thermalec have been established for over 30 years and are now regarded as the best electric heater available.They are designed for inground pools but are equally as good for above ground pools too. They are available in single or three phase from 3kW to 72kW. Thermalec Heaters are quiet, unobtrusive, easy to install and operate. Efficient and economical to run and when used in conjunction with a solar bubble cover, Thermalec takes full benefit of natures natural heat gain during the day, keeping your pool at a constant temperature throughout the season (not reliant on the weather). Thermalec takes full benefit of natures natural heat gain during the day, keeping your pool at a constant temperature throughout the season (not reliant on the weather). - Unique spiral flow allows efficient heat removal from the elements, minimising the scale and sediment build up. - The control thermostat is positioned to sense the incoming water temperature and controls the pool to within 1°c.# - The safety thermostat senses the water temperature leaving the heater. - Temperature rise within the heater due to poor flow is rapidly sensed by both thermostats, switching the heater off instantly, ensuring safety at all times. Heater body: Cast iron with heavy fusion bonded epoxy coating impervious to salt and chemically treated pool water. 35psi design pressure operating at a normal working pressure of 30psi gives protection to the whole installation. The drain valve allows the heater to be emptied for winterisation. Removable uPVC stub flanges mean no unions or heat sink are required. Flow direction is left to right, can be reversed on site (simple instructions in installation manual). Heating Elements: Copper, Incoloy or Titanium elements are individually mounted in a removable top plate, allowing easy element renewal and inspection of the interior of the vessel. Controls: Heavy duty contactors controlling the power supply to the elements are switched in turn by a filter pump interlock relay, control thermostat and safety thermostat, set to operate before the water temperature reaches 53°C. A 2a fuse protects the control circuit and a minimum of 6-indicator lamps monitor every stage of operation for simple diagnostic servicing. 36PHR – 72PHR – 120PHR models: Includes a thermometer to indicate outlet temperature, enables flow rates to be adjusted if fitted with a by-pass or used in multiples or operated in parallel with an alternative means of heating. 72PHR models: A time delay relay, engages the contactors in two stages, reducing electrical surges, a 2-step temperature controller overrides the time delay in the event of rapid temperature rises, 2 safety valves to cope with increased power. 120PHR models: Two time delay relays, engage the contactors in three stages, 2-step temperature controller and four safety valves. Two years against faulty workmanship or materials. We will repair or replace during this period any goods returned to our factory for inspection. This guarantee does not cover misuse or neglect of the heater.# Control Panels - Guaranteed for 12 months against faulty workmanship. Electric Pool Heaters - Are guaranteed for two years against faulty workmanship. 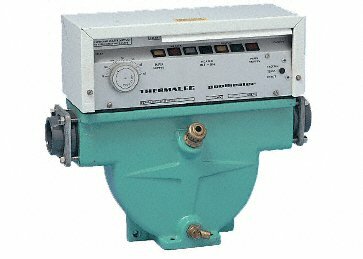 Thermalec Products founded in 1966, were the first company in the UK to manufacture a range of electric heaters specifically for the commercial and domestic swimming pool industry. In 1999, Thermalec joined the Meddings Group of Companies to enhance and diversify the Group’s engineering activities, enabling Thermalec to widen it’s horizons as part of a larger group. Having established itself in the UK as the market leader Thermalec pool heaters have now become the No.1 choice for electric heaters in the Middle East, Thermalec’s reputation for design, quality and reliability has allowed the company to expand into Europe, with agents in Germany, France, mainland Spain and the Balearics, sales into many emerging markets are now also taking place. Environmentally, Thermalec heaters are well positioned, having no constantly moving parts, noise levels are practically non-existent(heat pumps have fans and motors), and having no fumes or emissions a clean environment around your pool is easy (oil and gas heaters produce emissions). Inexpensive to buy, easy installation and low running costs with minimal maintenance, no compulsory annual inspection as an added advantage makes Thermalec Pool heaters the sensible option for heating your pool.# Mainly used for swimming pools, with models suitable for spas and fish ponds, no other heater has a lifetime guarantee of thermal efficiency – your running costs will not escalate due to the heater getting older. Every Thermalec owner wakes up to find that the pool water is just as inviting as it was yesterday and the day before. That is the great advantage of having a positive and powerful heating system. That smile also comes from knowing that keeping the pool at an even temperature all summer long will not have cost as much as other systems because both the heating and the filtration will have been carried out using Economy 7 only. Satisfaction too in knowing how little the heater cost to buy and maintain. The introduction and almost universal acceptance of the use of the floating solar blanket has been the greatest advance we have seen in over 30 years of specialising in pool heating. The blanket allows the Sun's rays to penetrate deeply into the water. It also seals the surface preventing evaporation and cutting heat loss night and day - halving the running cost. Most heating systems will start to heat in the early morning unaware that the Sun will do all the work necessary and so they start to heat while the Sun is out - wasting energy competing with the Sun. Because the Thermalec operates only during the Economy 7 period, starting at about midnight, its very sensitive control thermostat can detect exactly how well the water has been warmed by natural means, then makes sure the pool is exactly at the temperature you have set for your morning dip. After a warm day it may not have to heat at all, but after a dull day it may run for most of the night. During a typical summer it will operate for 3 or 4 hours on average, after the initial warm up period at the beginning of the season. Five whole months of swimming in beautiful clear clean water at temperatures well above those of the Mediterranean with a heating cost that is less than the cost of one package holiday for a week. With a 12’ by 24’ pool the total running cost of both heater and filter pump can be less than £240 for 22 weeks swimming at 80ºF as shown in the example given below. Using a Thermalec heater and taking advantageof low cost electricity at night for both heating and filtration gives you up to 22 weeks of summer swimming, without ever leaving your own garden. Taking a pool with a solar cover maintained at 80ºF for the whole 22 week season from early May to the end of September, our experience over 40 years is that you can expect on average a heat loss equal to 28 Units of electricity per sq.ft. or 300 Units per M² of pool surface area. This will be the heat loss from a pool of this size held at this temperature regardless of the type of heating system used. This then gives you a yardstick by which we may compare running costs. To find out the seasonal consumption, simply multiply the sq.ft. of surface area by 28 (or M² by 300). Most people we talk to do not realise that a pool only alters in temperature 2 or 3 degrees in 24 hours, but being a large mass of water it is thermally very stable. Consequently, heating a pool by night is the perfect way of using Economy 7 which is now much less than half-price electricity - much nearer 1/3rd of the daytime rate. The Thermalec utilises this power in the most economical way possible. Unlike a storage heater, which heats its core up to a very high temperature, much of which heat must be given off during the following day - The Thermalec simply heats its storage medium, the water you swim in, to the exact temperature you want to swim in and not one degree more. For example a 12 x 24 ft pool has a surface area of 288 sq.ft, multiply this by 28, you have 8064 Units. If the price you pay for E7 electricity in your area is 3pence per unit, then the total cost per season is £0.03p x 8064 Units = 24192 pence or in other words, roughly £242 per year. One of the many benefits of using a Thermalec on Economy 7 is that a dramatic reduction is made on the cost of filtration, as, in private pools, it is normally arranged for the filter pump to run during the E7 period. A ¾HP pump uses 1.1 units per hour or 8 units in 7 hours, which at £0.03p per unit, costs £0.24p per night or £37.00 per season. The heating and filtration costs together come to just £279 using the Thermalec system. With other systems the filtration costs add considerably to the total running costs. If for instance you compare this with a Heat Pump of the same daily output as a Thermalec, it can only give this output if the filter pump runs 24 hours per day and that will be on day-rate electricity at approx. £0.11p a unit. The heating cost is still based on replacing the 8064 units heat loss from the pool. Whilst the heat pump takes 3 parts from the air and one part from the mains, the 2000 units of electricity it does consume are at the day-time rate of £0.11p – making a heating cost of only £220. But the cost of running the same filter pump as above for 24 hours, just to transfer the heat from the Heat Pump to the pool is then 1.1 units x 24 hours x 7 days x 22 weeks x £0.11p per unit which comes to £448 for the season on filtration alone – and with the £220 heating cost totals £668. Other sizes and models are available please call us on 0845 128 4373 if the size you require is not in the list.